Serve chilled with a glass of Vintense Syrah! Bon appétit. Put the water in a pan and bring to boil. Pour the couscous into a mixing bowl, pour on the boiling water, cover and leave for 5 minutes to allow the couscous to swell up. Then fluff up immediately with a fork. Put aside to cool. In a bowl, whip together the olive oil, cider vinegar, mustard, garlic, salt and pepper. Put aside. 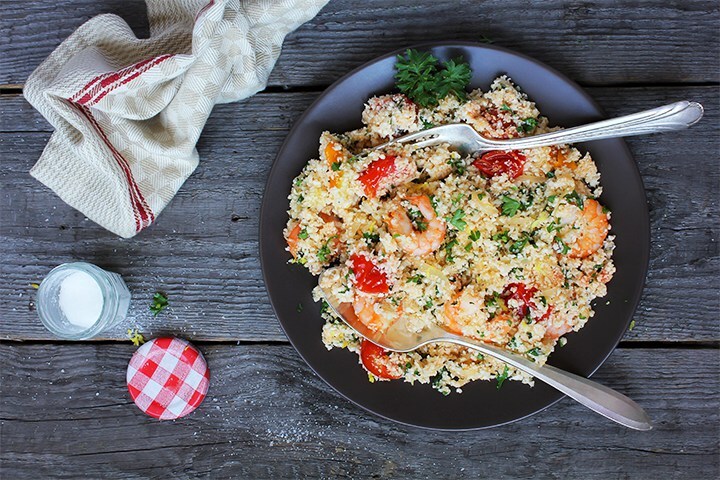 Add the prawns, pepper, cherry tomatoes cut in half and the chopped fresh herbs to the couscous.